Today we are off for a week to the East Region, Botauri, our diocese and home in the very near future when our permanent house is ready. We are looking forward to meeting the refugees and getting the feel of the refugee sites. We are going with Mr Michel Bizora , Project Coordinator and our boss. We feel at home already before setting off since we were able to meet the Bishop of Batouri and Fr Patrick (Social Work Coordinator) of Batouri diocese. 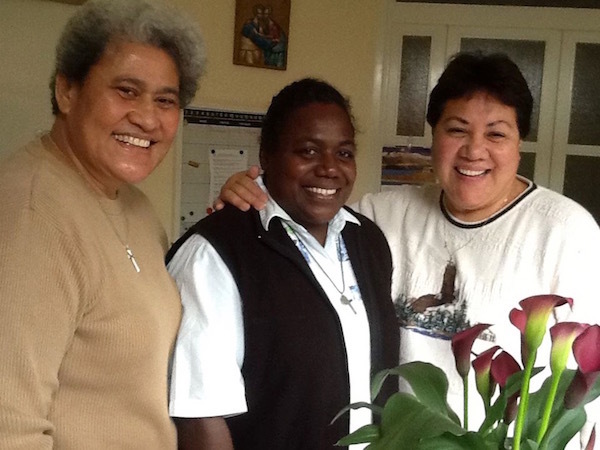 They expressed how happy they were that there are sisters on the Jesuit Refugee Services team. Education is the focus of JRS in the refugee sites since most of the people, adults and children alike, who crossed the border from the Central African Republic haven’t had any formal education before. A class of more than hundred students has only a few desks and chairs so first come first serve and the rest sit on the floor. So if you have some friends or benefactors who want to help SMSM mission, please don’t forget our JRS and the people in Cameroon. We’ll also collaborate closely with the JRS team of doctors, nurses (Red Cross) and community leaders. The three of us are grateful for our past mission experiences. Because of such exposure nothing is too overwhelming. But the JRS is different in itself and special in a sense. We pray for the grace to respond to each situation and challenge accordingly. Please pray that we’ll have good health because travelling is energy draining. The roads are terrible and the dust, dirt unbearable at times yet we do have faith that with God’s help and the intercession of Mary, all will be well. 19th April: 2nd Sunday in the Cameroons. We visited the Marist Fathers’ seminarians at their formation house with Frs Xavier Bechtoille (France) and Cyr (Benin). These are the treats Mary and her Son provide for the missionaries. So again thank you one and all for your loving support. We continue to hold each other and our missions in prayers.